Chany Sabates at International Yacht Collection adds to his roster of motor yachts for sale as I learn that he's listed Cheoy Lee's 27.4m Viaggio. Delivered in 2007, Viaggio is the only five-stateroom superyacht in this series and accommodates 10 guests. Fitted with a removable hardtop to allow easier access to the Great Lakes, she also comes complete with a dive compressor and an enviable charter record. 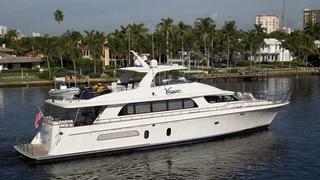 Viaggio is asking $3,499,999.